Early lambing flockmasters will have a wider choice than ever at the 27th Annual NSA Wales & Border Early Ram Sale, to be held at the Royal Welsh Showground on Monday 7 August 2017. There are nearly 700 rams entered for sale, 150 more than last year, with the bigger numbers in the Texel and Charollais rings. The extended choice, coupled with a significant lift in lamb prices early in the year augurs well for the sale. It is well established as the place to come to for early lambing flocks wanting the pick of the rams ready for tupping and traditionally sets the price for top quality, healthy, assured rams. “The sheep job is buoyant, well above expectations. The early prices have been good and hopefully this will encourage the trade at the early sale. 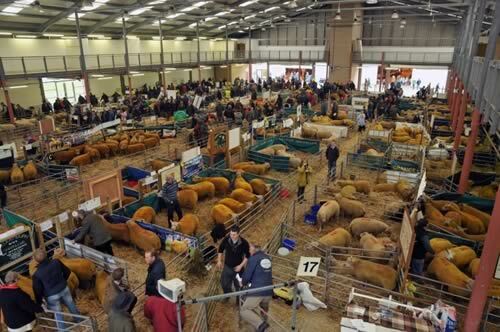 This years sale will include official sales on behalf of the British Charollais Sheep Society, British Texel Sheep Society and Hampshire Down Sheep Breeders. Last year’s early sale grossed £213,615, Headline prices were also up on the previous year, with the highest priced ram, a Texel shearling from Dewi Williams, G P Williams & Co, Abergele, sold to Michael James of Maes Mynis, Builth Wells for 3,350 guineas.